Finely grate 1/2 tsp (2 ml) of zest from orange; set aside. Squeeze out 1/2 cup (125 ml) juice. In a bowl, combine orange juice, garlic, and honey. Heat a large nonstick skillet over medium-high heat. Add chicken in a single layer and sprinkle with salt and pepper. Brown chicken, turning once, for about 3 minutes. Transfer to a bowl. Pour orange juice mixture into pan and bring to a boil, scraping up any brown bits stuck to pan. Boil for about 3 min or until reduced by about half. Return chicken to pan, discarding any accumulated juices, and stir to coat in sauce. Stir in orange zest and cream and bring to a simmer. Reduce heat and simmer, stirring, for about 2 min or until chicken is no longer pink inside and sauce is slightly thickened. This is for 2 servings. Just double the recipe for 4 people. Place acorn squash, cut side down, in a large baking pan or dish; pour water into bottom of pan around the squash. Bake 20 minutes. Remove from oven. Meanwhile, in a bowl, combine butter, lemon juice, cinnamon, brown sugar, and chopped apples. Divide mixture evenly among partially cooked squash and return to oven for 60 minutes or until tender when flesh is poked with a fork. Sprinkle with chopped nuts to serve. 1. Wash the lettuce, dry thoroughly, tear into bite-size pieces and refrigerate. 2. To make the dressing, mash the tomatoes with the spring onions until they almost form a paste. Add the remaining ingredients, except for the lettuce, and beat with a whisk. Refrigerate until needed. 3. 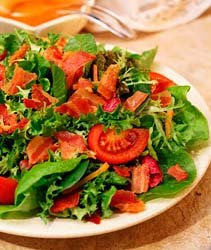 To serve the salad, place the lettuce in a large salad bowl, pour the dressing on top and toss well. Serve immediately. Bring the outdoors in with some Autumn leaves and pretty candles on your table. Yummy. I can't wait. Have a great Tuesday. All this looks so good! I am a big fan of chicken. As a matter of fact my lunch today includes roast chicken! 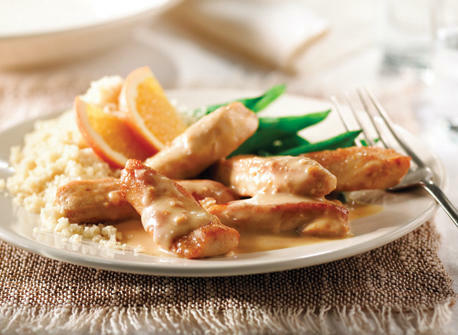 I must try the honey orange chicken in the near future. Take care and enjoy the rest of your Tuesday. The chicken sounds tasty!! I need to get oranges! Now my hot dogs are looking to good. The stuff squash looks so much better. Good morning. I just stopped by your lovely blog and am following you now too. I love antiques also and a nice glass of wine also! The food looks amazing and your table setting is so inviting! Just lovely. Have a great day! Oh me this blog has so many good things in it and I've just begun to look. I'm your newest follower. Love it!